RSAT on Windows 8 works (but fails). Today – less PowerShell-ish topic, although PowerShell was both used and was main reason I started this journey. Few days ago Windows 8 RSAT RTM went out. Like many other admins I jumped on this wagon as soon as possible. I’ve installed the package and… nothing happened. I haven’t seen any errors yet tools that are part of RSAT where not present on my box. What I did? Obviously, I went to google and asked for solution. But found only few other folks that had the same issue, and many others who installed this package without any issues at all. Something had to be different, but I had no idea – what? Shell for Windows not Bash for Windows. I love PowerShell. Literally it saved my behind several times, made my work on Windows 100s more fun than it was before it was shipped (or rather before I tried it and got familiar with all it’s concepts). My first meeting with scripting was bash, but it was long ago, so maybe I will miss some points in this article. But there are so many articles written by *nix experts that tried to jump in opposite direction and were disappointed, that I decided to write this thingy to maybe explain why (in my maybe not very humble opinion) that was the case. Pain of growing too quickly. Another thing I would like to point out. It’s unfair to compare something mature and improved over last 30 years with stuff that is still not full-featured yet. As Jeffrey Snover keeps saying all the time: Microsoft is digging itself out of the big hole, and it takes time. I would imagine it also forces PowerShell team to make some painful decisions: we won’t make this, this and that in this release. And now when PowerShell is a part of Windows as a whole the release cycle is tied to OS cycles. 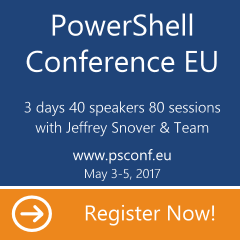 It forces us, PowerShell users, to wait longer for new improvements. Good part is that PowerShell team did a great job to make it possible (and pretty easy too) for community to extend functionality of PowerShell. Many requests I’ve seen from *nix folks were implemented long ago by creators of PowerShell Community Extensions (pscx) but still, some things that we (users) and team (trust me on this one) would like to see in PowerShell will take a while to complete. It does not mean that we can’t do it ourselves already (I hope to find out HOW during TechEd next week, there will be session that I simply can’t miss exactly about that) – it means that we can’t assume given functionality is available on every box, and of course it makes our life harder (WE need to check if given module is installed on box). But the fact that we can prepare some really wonderful extensions without asking Microsoft to do it makes it really great. But to have mature product – we need more time. I will wait, I’ve already see it’s worth it. Different world, different shell, different mind set. I’m windows admin for quite some time. Do you know how often do I need to parse text to solve tasks? My world is built of objects. Even text is build of objects. I need something that simplifies working with objects and makes it possible to automate object creation, usage and recording (as text, obviously, I can not read anything else unless it’s image). Folks from *nix part of the world come to windows and want to have something, that would improve their life inside it. They assume shell is only good if it’s built on text parsing, because they are used to that kind of shell scripting. Seen comments that ‘cp’ is obvious command (oh really…?). Sorry guys. You are obviously trying to convince world, that only because you spent time and learned by hard all commands and patterns from *nix shells, than Windows shell should follow same rules. I see reason why this assumption is made. When you see ‘ls’, ‘cat’, ‘cp’, ‘rm’ – you may start to think that this is just bash-clone on windows box. And it’s not the point: all those aliases are created only to allow shell users (both cmd and bash) to use some commands that we already have in memory. No way ‘cp’ is more obvious than Copy-Item. If I have no idea what Select-String does I can guess. Try guess what poo command would do? Or huhu command? And what about Get-Elevator? Show-Picture? We have many objects, our world is too complicated to study by hard all shortcuts that team producing some functionality thought were cool and easy to remember. That’s were PowerShell saves our back. We can do lucky guesses, we can Get-Command, Get-Help, we can push object all the way and Get-Member, make lucky guesses on that members too. And move on. Really, something that I would like to see everywhere. Meanwhile I had chance to participate in VBS + WMI training and I really enjoyed both the training and writing scripts in VBS. But life was never same again… 😉 I’m PowerShell addicted now, and write both VBS scripts (in areas where it would be possible to share it with others in my organization) and PowerShell scripts/ one-liners – for myself. 🙂 I also like to do things that can be done GUI-way in PowerShell directly, just because it’s quicker and more consistent than to click my way thru GUI interface. Why in English? Mainly because I use EN_en at work. If I do something in IT area I usually think in English. 😉 So even though my English is not as good as I would like it to be, I don’t see any other option.